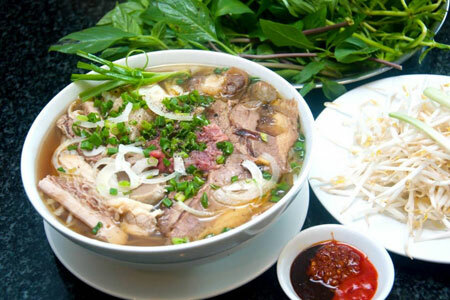 Pho, a typical dish of Ha Noi people, has been existing for a long-time. Dishes made of soft noodle soup are diverse such as vermicelli and fried chopped meat, Bun Thang, vermicelli and sour crab soup, stewed vermicelli and boiled lean meat, etc. The popular dish is vermicelli and sour crab soup whilst Bun Thang is for con-noisseurs, unique and available inHa Noi only. A bowl of Bun Thang includes lean pork paste, thin fried egg, salted shredded shrimp, chicken, onion, shrimps paste, and a little Belostomatid essence. Especially, Bun Thang bouillon made from shrimps and meat must be very sweet and pure. Without enjoying Bun Thangwhen arriving to Ha Noi, it somewhat seems to lack of a part of taste ofHa Noi. Snail dish is a popular but unique dish of Ha Noi people. It is easy to order some dishes like snail steamed with ginger leaf, gingered snail, snail sauted with carambola, snail boiled with lemon leaf, snail steamed with Chinese herbs, and so on, in many small restaurants, restaurants, and even hotels. Every autumn, around September and October, when the cool north-westerly wind brings a cold dew, the sticky rice ears bend themselves into arches waiting for ripe grains because these rice grains are at their fullest and the rice-milk is already concentrated in the grains, predicting that thecom season has arrived. 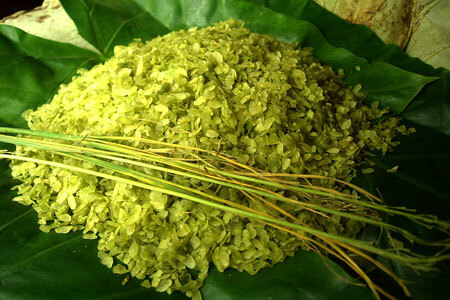 Com is an ingredient also used in many specialities of Viet Nam, includingcom xao (browned com), banh com (com cakes), che com (sweetenedcom soups), etc. Com may be obtained anywhere in the North of Viet Nam, but the tastiestcom is processed in Vong Village, 5km from Ha Noi, where com making has been a professional skill for many generations. Cha ca La Vong is a unique specialty of Hanoi people, therefore one street in Ha Noi was named as Cha Ca Street. 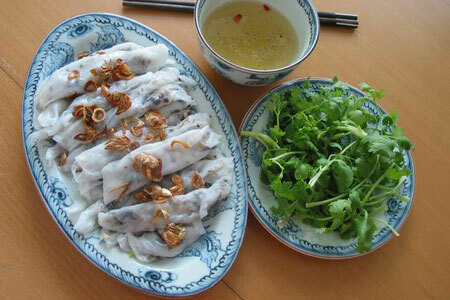 Banh cuon is popular to Vietnamese as disk for breakfast. The cake preparing process includes grilled rice which is steamed and oil-spread to have sweet-smelling. Banh cuon is prepared available. Leaves of cake put on plate as the customers ask for the disk. The cake is called Banh cuonThanh Tri due to its origin is Thanh Tri Village of South Ha Noi. BesidesBanh cuon Thanh Tri, there is rolled rice pancake with the filling of the cake is made from minced pork mixed with Jew's ears and thin-top mushrooms. The cake, placed on plate, serve with salted shredded shring and fried dry onions. The customers immediately experience the disk as it is just finished and stilI very hot. It is the sauce of the cake that fascinates the customers. The cake-makers have their own know-how, some of them prepare Banh cuonwith Belostomatid essence to have sweet -smelling to attract to the customers. Anyone who arrives in Lang Son Province could find it difficult to say no toLon quay dish. Lon quay Lang Son is delicious for many reasons, however, the main specific taste of the dish comes from the unique flavor of a kind of leaf called "Mac mat" (meaning "sweet leaf"). The leaf is soaked with spices, fish sauce, glutamate, flavoring powder, then stuffed into clean pig belly and placed on reverted furnace. Pig is fried the spread with watery honey so as to make the skin turn golden and brittle, and pork is soft and sweet-smelling as finish. All people who used to live in Ha Noi are familiar with Banh tom Ho Tay Restaurant on the Thanh Nien (Young) Street. The cake preparing process includes wheat flour mixed with potato fibres, placing on shape with shrimps upper, then fried with oil. The cake is brittle, soft, sweet-smelling, and served with vegetable pickles and sweet and sour fish sauce for best taste.